Dole office workers and council workers are defying their employers’ attempts to get them to enforce the poll tax. Councils country-wide have been engulfed by a tidal wave of poll tax bureaucracy that threatens to push the ‘community charge’ system to collapse. A mutiny is now well-underway in the Tories’ own ranks. Sensing the strength of opposition they face, their nerve is beginning to crack. As the first poll tax demands are sent out in England and Wales, the Tories ‘flagship’ is clearly in trouble. The battle against the poll tax is now entering its most critical stage yet. This pamphlet sets out to show how that battle can be won – by uncompromising, united working class resistance: in the communities where we live, and the places we work. It argues that those struggles must be controlled directly by those engaged in them – outside the control of the Labour Party, local councils, the party-building left or any other set of would-be bosses. The chaos that surrounded attempts to compile ‘regis­tration lists’ of those liable to pay in Scotland, has been repeated in England and Wales with organised disruption of the process threatening to push the system to collapse. Worried council officials are warning that they may not even be ready to send out the first bills in England and Wales until May or June – putting everyone two months in arrears to start with. The efforts of Scottish councils to beat the non-payment movement by taking money direct from people’s bank accounts, or by seizing goods from their homes to sell are failing dismally. Communities have mobilised to protect each other and see off the bailiffs. Workers in dole offices and council finance departments have threatened strike action if they’re ordered to deduct unpaid poll tax direct from Claimants’ giros or council workers’ wage-packets. Despite all the pressure from the government, and media black-out, despite all the attempts at sabotage by Labour leaders, and the endless claims of the ‘impossibility of building a mass campaign of non—payment of the poll tax – an enormous number of working class people in Scotland are united in just such a movement. And all the gloomy predictions that the non-payment campaign would collapse once the first bills were received, have been shown up as defeatist drivel, out of step with the mood of anger and defiance that exists in working class com­munities Scotland-wide. It’s not just the case that the non-payment movement is ‘holding firm’. As more and more people have realised the state most Scottish councils are in, and their inability to chase up those not paying, many who paid a ‘first instalment’ on their poll tax bill, have re-joined the non-payment movement – swelling the numbers of those involved. It’s a movement that’s not about to collapse or fizzle out. The same Labour authorities who claimed that non-payment was a non-starter now accept that. Other figures are hard to come by – after doing their own sums, most councils are keen to keep quiet about their estimates of the strength of the non-payment campaign they will face. Even the opponents of the non-payment campaign those very same local authorities who said it would never get off the ground now admit that they face a long, drawn-out and bitter battle against large numbers of working class people. The coming weeks will be crucial in the battle against the poll tax in Scotland. Councils – whose best attempts to wipe out the non-payment campaign have failed again and again – have been forced to up-the-stakes and have gone on to the offensive. At the end of last year, around 400,000 final demands to settle the whole of the first year’s poll tax within 14 days (or face the consequences) were sent out. Strathclyde region sent out an additional 300,000 7-day final demands to those people in arrears in its area. When – at end of the week – over 80% of these ‘final’ demands had been totally ignored, exasperated council officials conceded that the response had been ‘disappointing’. People have realised that – with the council adminis­trative machinery still in chaos – them ‘threatening’ to seriously take on the non-payment campaign is nothing but a joke. The idea that the same councils who even now don’t know exactly how many people aren’t paying because their systems aren’t yet sorted out enough to count them properly could take hundreds of -thousands of people to court; wage or benefit ‘arrestments’; or issue thousands of bailiffs warrants, is just plain laughable. Throughout Scotland there are endless stories of babies, the long deceased and fict­itious people receiving poll tax payment books, while many of those liable to pay are still without them. Other people have received as many as twenty. Rebate applications are, taking months to process. Councils – dogged by computer viruses and constant govern­ment revision of the rules – can’t even keep up with the thousands of genuine changes of address and circumstances they need to process every week, let alone repair the damage being done by deliberate disruption and sabotage. · The heads of Scottish clearing banks announced in late-November that they simply wouldn’t be able to cope with thousands of council requests to seek out the bank account details of non-payers. Even if they could it would cost a fortune and take forever – and they couldn’t guarantee to find even 5-6% of the names. · Bailiffs raids on the homes of working class people have proved so unpopular – and have been met with such fierce community resistance – that many councils are already considering abandoning them altogether. Groups of bailiffs, backed by police protection, have been met by angry crowds hundreds strong when they’ve ventured onto Scottish housing estates. Time and again councils have been forced to drop the action. The latest blow to poll tax bosses came in December when officers from the Data Protection Agency ruled that over two hundred councils had asked ‘illegal’ questions on their registration forms. They’ve been ordered to go through each and every one of their computer files to erase the wrongly-held information – as if they didn’t have enough problems already. Councils everywhere are in a mess and well-behind schedule. In Scotland many are unable to conceal their grow­ing panic. We should contribute as much as possible to increasing and spreading the chaos in which they find themselves. And what better time to go on the offensive than when our opponents are weak and disorganised? Pleading with council bureaucrats is a more than a futile waste of time: it’s actually counter-productive. It encourages illusions that councillors can be ‘won’ to our side, and that the power to smash the poll tax rests with them. Taking the fight against the poll tax inside the council means building links with the only group of people really capable of putting a spanner in the works of the councils’ implementation machine: council workers. He couldn’t have put it more clearly: if hanging onto power means enacting the most vicious series of attacks on the living standards of ordinary working class people – it’s a price that Labour councillors are more than willing to pay. The December deadline for the completion of poll tax regis­tration in England and Wales passed with a massive number of people still not registered, and a huge backlog of work unprocessed. The complexity of the ‘community charge’ legislation and the tightness of the timetable local authorities are having to work to – all work to our advantage. From Birmingham to Tower Hamlets groups have organised mass burnings of registration forms. Poll tax offices have been occupied, and council meetings stormed. The non-registration campaign has also helped community based groups organise door-to-door canvassing to mobilise support and spread information. Accurate figures are hard to find, but recently, over 30% of residents of the Tottenham area of London had still refused to register, and on the Broadwater. Farm estate, that figure rose to 95%! The strength of organised resistance to the poll tax is – currently – rooted in the community-end of the campaign. It is the non-payment campaign that has provided the focus for working class poll tax opposition in Scotland, and inspired thousands with the confidence to break the law and take on the government – both local and national. And it looks set to be the same story in England and Wales in the Spring. The spread of community-based organisation has not – so far – been matched by a similar level of workplace and industrial activity. Poll tax preparations were threatened not because workers employed to organise poll tax were angry enough to strike against it, but because – in pursuit of their pay claim – they’d withdrawn their labour to pressurise councils into increasing their wages. Some anti-poll tax groups visited picket lines to offer support and argue the case for sabotaging poll tax col­lection from within. But, although many good direct contacts were made, once the pay claim had been settled, strikers returned to work, and the poll tax machinery was activated again. The urgent need, then and now, is to turn that incidental disruption into active, conscious solidarity. Low-paid council workers have no interest in implementing poll tax – they can no more afford massive poll tax bills than any other working class people. And the destruction of council services that the po1i tax brings with it, threatens their – and other council workers – jobs directly. Manchester postal workers earlier took unofficial action over the poll tax. They refused to sort registration forms for delivery. Though the action later collapsed in the face of both union and management opposition, it showed the level of anger that exists – and points to the kinds of actions that are possible. In January, a clear majority of the 17,000 workers employed by Leicester Council voted in favour of industrial action if the council issues a single redundancy notice because of poll tax—inspired service cuts. They realise all too well how Leicester council’s plans to slash budgets in the coming months, threaten their jobs and services – and they’re right to organise themselves now, before the council has even announced which sectors face the axe, so they can prepare properly to resists the attacks, and show the council they mean business. It’s clear that workers wanting to take action against the poll tax will come into immediate conflict with their unions. Local government union NALGO may have an ‘anti-poll tax’ position on-paper, but the reality is that – like all other union bureaucracies – they will seek to contain and limit workers anger, trying to prevent effective action breaking out beneath them. Union officials faced with council demands for massive job cuts, won’t fight them wholesale, but will rush in to ‘negotiate ~away’ those jobs as ‘fairly as possible’ and ‘help the council out of a tight spot’ as ‘painlessly’ as they can. Workers’ immediate interests are in defending their jobs and wages and in protecting the services that other working class people use and need. The interests of the union are in protecting their position in the pecking order, and their ‘right’ to be ‘consulted’ by the bosses. Just as community mobilisations against the poll tax need to organise outside arid against the Labour Party mandarins in the town hail, workers – whether directly involved in poll tax work or not – will need to organise outside and against the union bureaucracy. Most crucially of all, they need to link community and workplace struggle together – not through the mediation of ‘left-wing’ councillors or ‘progressive’ union bureaucrats -but directly, to co-ordinate and unify their struggles. The poll tax can be beaten. But it can only be defeated by militant autonomous action by working class people out­side the control of all unions, parties or leaders. The Tories ‘flagship’ is in deep trouble – the right sort of action could sink it once and for all. IN MID-OCTOBER Scottish Labour councillors led a march in Edinburgh to condemn the use of ‘warrant sales’ against those people who were refusing to pay their poll tax. They applauded Scottish TUC boss Campbell Christie, who – addressing the rally – condemned bailiffs raids on the homes of poor families as ‘immoral’ and ‘inhuman’. Christie neglected to point out that the councils res­ponsible for such ‘immoral’ and ‘inhuman’ attacks on the working class were in almost every case in Scotland controlled and run by the Labour Party. Those same Labour councillors who joined him in denoun­cing warrant sales, were the very people responsible for sending the bailiffs out in the first place. Nothing could better illustrate the role that the leaders of the Labour Party and trade union movement have played in the struggle against the poll tax, or better show the contempt in which they hold ordinary working class people. For, despite all their claims to be an ‘anti-poll tax party’, from the earliest days of the anti-poll tax campaign the true agenda of the Labour Party and their allies in the trade union bureaucracy has been clear. Their attacks on the anti-poll tax struggle have been relentless – they’re tried to sabotage resistance again and again. But their wrecking tactics have failed. From the beginning, the Labour Party’s twin strategy of trying to disguise its total compliance with the poll tax, and spike all effective opposition to it, has been ruthlessly pursued. The first battle they waged against the emerging poll tax struggle, was to predict its ‘certain defeat’. As early as January 1988, Labour leader Neil Kinnock warned a conference in Edinburgh, that even to consider building a mass campaign of poll tax non-payment was ‘a fruitless council of despair’. He called on those working class families faced with finding money for massive poll tax bills they simply could not afford to ‘do nothing and wait’ for a certain Labour victory in the next election. His pleadings met with a contemptuous response. As anger against the poll grew and became more vocal, the Labour Party and the Scottish TUC decided that they needed to be seen to be doing more to ‘oppose’ the hated ‘community charge’. So while Labour controlled authorities throughout Scotland busied themselves spending thousands on computer systems to compile registration lists, the Labour Party and STUC together launched the ‘Stop-It’ campaign – claiming they wanted to help people disrupt and delay the registration process! The whole thing was a sick joke. For while Labour bureaucrats organised token symbolic ‘opposition’ to the compiling of the lists, their party colleagues in local town halls prepared to despatch snoopers to working class estates, and threaten with fines those who wouldn’t sign up. Many Labour authorities paid for purpose-built new office space to house their poll tax operations – hoping that by separating it from other council work, people might somehow not realise what the council was up to. Birmingham Labour council named its new poll tax office ‘Margaret Thatcher House’. Labour’s desperate attempts to disguise its backing for poll tax, were fuelled by fears of the consequences of work­ing class families in Scotland receiving massive poll tax demands courtesy of their ‘socialist’ Labour local council. But the ‘Stop-It’ campaign failed dismally to stem the growing tide of organised resistance to the poll tax, and worried Labour leaders were forced to change their tactics. After trying to divert growing industrial unrest over the poll tax into an 11-minute stoppage – and with the im­minent arrival of the poll tax in Scotland – they were forced to concede that they hadn’t done enough to spike the struggle. Despite their best efforts, it was clear even to them, that a mass movement committed to beating the poll tax through a combination of non-payment and industrial action by council – and other – workers was preparing to take on the Labour authorities who control most of Scotland. Just a few days before the first bills were sent out, Campbell Christie – addressing a hostile and angry crowd at an anti-poll tax demonstration – declared: ‘I am not having any clowns challenging my credibility over this issue’ and promptly tore up his payment book, announcing he would now support ‘a three month period of non—payment’. Christie’s last-ditch effort to re-assert control over the movement was met with derision and laughter. Poll tax law allows a maximum three-month period in which to pay up – Christie’s intervention was the equivalent of announcing that you aren’t going to be paying your gas bill until you got the red one. The thousands committed to ignoring bills they couldn’t – or wouldn’t – pay and who’d been repeatedly attacked and denounced by Christie and his cronies, were now being told they had his backing for a 12-week refusal campaign – at the end of which they should pay up and give in. Long after Christie’s 12-week deadline had passed, the first official figures were released of those refusing to pay – showing hundreds of thousands were withholding payment. Subsequent figures confirmed that this non-payment movement stretched Scotland-wide. Labour local government spokesman David Blunkett immediately condemned this inspiring level of resistance. ‘The blame for such high levels of non-payment’, he declared ‘must be placed squarely at this government’s door’. Scottish Labour councils eagerly joined the chorus, angrily refuting claims that they weren’t pursuing non-payers aggressively enough – falling over each other in the rush to prove their commitment to enforcing payment. In England and Wales – as well as in Scotland – the problem that the Labour Party faces in trying to sell the idea that what its doing its ‘complying reluctantly with the hated Tory tax’, is that Labour’s compliance has been anything but reluctant. In practically every single case, Labour’s response has been one of active, enthusiastic support. The Labour Party’s fear of the anti-poll tax movement is growing. Before now, Labour has been willing to lend support to demonstrations against the ‘community charge’ as a low-risk way of parading its ‘opposition’ to poll tax. But in mid-December Neil Kinnock rejected a plan from his own front-bench poll tax spokesmen to call a national demonstration on April 1 1990, because he feared that groups committed to non-payment and strike action might ‘take advantage’ of the situation – and expose Labour’s true poll tax colours. The poll tax is the cornerstone of the Tory’s strategy for destroying the political and financial power of local councils. In the years before poll tax, the Tories have repeated taken chunks from that power base: rate capping, cuts in rate support grants, compulsory tendering of services, the abolition of the GLC and the Metropolitan authorities, the right-to-buy council house legislation, and so on and so on. Now they have set their sights on dismantling council housing, forcing competitive tendering on such things as meals-on-wheels, home helps, and – through the ‘opt-out’ proposals – of severing councils’ links with local schools and hospitals. The Tories vision for the future of local government is one in which small groups of budget managers and civil servants – with no financial or political clout – oversee the running of a massively reduced network of privatised contractors. ‘Accountability’ is the key word the Tories bandy about when they justify the introduction of the community charge. Accountability of the council to the electors who vote them in to office. The flat-rate poll tax, by shifting the burden of paying for council services far more onto the shoulders of the poor, will mean that working class people won’t be able to afford to vote in councils prepared to spend money on the services they need and use. Come election time, par­ties will compete to offer voters the lowest poll tax rates – by budgeting to spend the least money on services possible. At the same time the Tories has taken from councils the power to levy rates on local businesses. The traditional Labour left council’s way of upping revenue, has been to slap higher bills on business and industry – before increas­ing domestic rates. Now the Tories will set ‘enterprise. friendly’ business rate nationally – far lower than present levels – leaving councils with no get-out, and meaning that even to maintain services at current levels, domestic bills will have to soar. Manchester Labour City Council has put the choice starkly. It offers two options: ‘A poll tax bill of £708 per person; or – to get a figure of around £400 per person – a £95 million package of cuts’. Leicester council are plan­ning 10% cuts initially to get an ‘acceptable’ £370 bill. Nottingham council say to get to £274 figure, will mean £36 million worth of cuts and 2,000 job losses. These examples are typical. As an incentive, the government recently published its own estimates of ‘acceptable’ levels of council spending – and a list of accompanying poll tax rates. On the figures 380 councils out of 402 already ‘overspend’. The government hope to blame higher than-estimated poll tax bills on ‘irresponsible’ local councils who spend too much. Poll tax Minister John Patten recently hammered the message home – announcing that the Tories would ‘poll tax cap’ any authority that didn’t slash budgets, destroy ser­vices and sack workers. But Patten is just playing safe. He knows – and the Tories know – that Labour councils will dutifully fall in line one after another. After the rate-capping battles of a few years ago, and the actions of inner London local author­ities more recently, its clearer than ever that Labour~ authorities know where their loyalties lie. If clinging to power means attacking the working class more viciously than ever, Labour authorities can be relied upon to take on the task with brutal efficiency. If anything, Tories councillors in the leafy-Shires of southern England have squealed more loudly against Patten’s capping plans than Labour authorities have. It’s for that reason that the Tories expect the non-payment campaign against appalling high poll tax rates only to last for two or three years at most. Not because people will give up on the struggle, but because within that time, they predict poll tax levels will fall back to something like average existing rates bills, as councils wage a downwards spiralling budget-war in the hope of winning power. While we need to understand the objectives of the Tory’s war on councils, the only concern for working class people is in the interests of our class – immediate and long-term. It’s not in our interest to rush to defend the instit­ution of local government; to back one section of the State against another; or to defend the idea of ‘benevolent’ councils providing the ‘deserving poor’ with services we should be ‘grateful’ for. We oppose the poll tax because it means massive fin­ancial burdens for working class people, threatens the decimation of services that working class people need and use, and promises to throw thousands of council workers onto the dole. We oppose it because it means working class people being subject to wage arrestments, bailiffs raids, court fines and theft of their benefits. Not because its ‘undemocratic’, not because its ‘unfair’, not because its ‘unjust’. Because we know that for the working class those concepts are meaningless under capitalism, and it implies that we think there is a ‘just’ and a ‘fair’ system to be had under capitalism. It’s not our job to come up with ‘better’ ways of gen­erating local council income, of funding local services – for that same reason. Our interest is in seeing the poll tax defeated by the organised power of the whole working class. In encouraging people to build their own direct forms of organisation, that cross the artificial boundaries that are erected between workplace and community organisation, and offer the potential of specific, partial struggles being generalised into wider battles. Crushing the ‘community charge’ would increase our class’s confidence – and strengthen our ability to take on the whole stinking system that spawned the poll tax in the first place. Our eventual goal must be to do away with that system and create a society in which we are able to exercise real control over our lives. A society without bosses or political parasites, where we will be able to organise our lives for the mutual benefit of all, not a small class or employers and property owners. WHILE EACH OF the dozens of ‘Left-wing’ political parties involved in the anti-poll tax movement have unveiled their own supposedly-distinct ‘strategy for winning’ – they’ve all been united on the central question of who they think holds the key to victory: and it isn’t the working class. The ‘responsibility’ for the success of the poll tax struggle – according to the Left – lies with the leaders of the Labour Party and the trade union movement. The problem – as the Left sees it – is not that union and Labour leaders are out to wreck the poll tax struggle, but that they aren’t – as yet – doing enough to support it. Throughout the campaign the Left have endorsed each successive act of sabotage by those bureaucrats – even claiming that these acts prove that the bureaucracy is moving in the right direction. So when – in a calculated attempt to head-off wide­spread industrial unrest over the poll tax – the Scottish TUC called the now-infamous eleven-minute ‘tea-break stop­page’ against the poll tax, they won overwhelming backing from the Left – whose only objection seemed to be that this wasn’t really ‘long enough’. The Socialist Workers Party called on workers to ‘make the most of the action’ and ‘demand’ that the bureaucrats extend it. Instead of denouncing it as a wrecking-tactic, the Left took the opportunity to applaud the STUC’s ‘fighting spirit’. The Left have sought to excuse, justify and explain away the Labour Party’s attacks on the struggle – endlessly repeating their ‘surprise’ at Kinnock’s compliance with the poll tax, and bemoaning the ‘cowardice’ of Labour council­lors who ‘won’t fight’. They’ve sought to focus attention away from the need to build autonomous working class action against all branches of the poll tax machine – and towards placing ‘demands’ on our enemies in town halls, union offices and in Parliament not to attack us. At every turn, the Left has sought to undermine the growing confidence and independence of working class poll tax resistance – hoping to take the initiative out of the hands of working class activists, and give it back to the very forces that want to destroy the chance of a real battle against the poll tax. Some on the Left genuinely believe that Kinnock and Co can be ‘forced’ to fight. But others issue ‘demands’ on Labour leaders knowing in advance that such calls are hope­less. They do this in the hope that people will conclude -when their ‘demands’ aren’t realised – that what’s needed are ‘new’ and ‘better’ leaders, politicians, bureaucrats and officials that are ‘really on our side’. As the Socialist Workers Party poll tax pamphlet bluntly explains: ‘If the real responsibility for the cam­paign is pinned squarely where it belongs, it will enable people to see where the real fault for any defeat lies. Pointing away from the organised working class lets Labour and trade union leaders off the hook. For it is they who have the power to launch activity and who are running away from their responsibility’. In other words, for the SWP and their ilk the ‘job of socialists’ is to cynically and dishonestly push the cam­paign towards a strategy they know can only fail – in the hope of picking up members for the party machine in the aftermath of its collapse. The one consistent theme that runs right through the story of the SWP’s ever-changing analysis of the poll tax fight has been their blatant opportunism. As the Party leaders have continually re-assessed the mood of the movement, their ‘line’ has been repeatedly re­hashed and repackaged in a desperate attempt to keep in step with the struggle. To start with, the SWP actively attacked the idea of community-based resistance to the poll tax – dismissing it (in much the same way as Kinnock did) as ‘unrealistic’. For the SWP, only action in the workplace held out any hope at all. Their 1988 poll tax pam­phlet (since withdrawn) explained: ‘Community organi­sation stands in stark contrast to the power of wor­kers organised in the workplace. Community politics diverts people away from the means to win, from the need to mobilise working class activity on a collective basis. And by putting the emphasis on the individual’s will to resist, any difficulties and defeats will be the respon­sibility of the individual alone’. By deliberately misinterpreting the non-payment stra­tegy as one relying on individual, isolated acts of unconnected defiance, the SWP sought to .show how much more effective collective industrial action would be. The ‘case’ as they set it up (contrasting individual refusal with collective resistance) proving itself. For the SWP ‘class action’ only exists in the factory and office – only ‘workers’ have a part to play in the class war. Action that mobilises working class people beyond the factory, that seeks to forge united class-wide action, is – for the SWP – a diversion to be resisted and opposed. So convinced were the SWP that mass community-based non-payment would collapse within a couple of months in Scotland, that by the early Summer of 1989 in the pages of Socialist Worker the ‘defeat of the poll tax struggle’ had joined the ritual list of set-backs that the working class had suffered in the current ‘down—turn’. But their leaders soon sensed that their announcement of the ‘collapse of poll tax resistance’ was unlikely to win them much credibility on the housing estates in Scotland where thousands were steadfastly refusing to pay up -despite the SWP’s gloomy predictions. So the Party did an abrupt U-turn. Suddenly ‘diversion­ary’ community-action was a struggle worth fighting. In total contradiction to their earlier statements, the pages of Socialist Worker now proclaimed: ‘There is no rigid divide between struggles in the workplace and in the com­munity. Community campaigns can often achieve real victories’. This was only the latest in a long series of ‘revisions’ of the Party line. Initially the SWP argued strongly for non-registration. Later they dropped this demand. Then they criticised Labour leaders for not ‘leading a non-registration campaign’. Later still, they concluded non-registration was ‘a mistaken tac­tic’. First off, they supported the building of ‘committees of 100’ of ‘notable’ non-payers, only to decide within weeks that the committees were ‘elitist’ and ‘irrelevant’. It’s anyone’s guess what the position of the SWP on the poll tax struggle will be next month. Currently the Party hierarchy has ordered the membership to ‘withdraw’ from their poll tax ‘work’ to concentrate their recruitment ef­forts elsewhere – but its certain they’ll be ordered back in again if their leaders sense the ‘mood ‘ once again offers the potential for signing up some new members. Many months ago, Militant’s leaders decided that the emerging poll tax struggle would be an ideal ‘host’ for their parasitical work. They hoped that by creating ‘community’ organisations committed to defeating the poll tax through a non—payment campaign they could win themselves recruits both to the Tendency and to the Labour Party itself. Every decision they have made on their campaigning strategy has been based on what they think best serves the interests of their struggle within the Labour Party – not on what’s best for beating the poll tax. As Labour leaders have cottoned on to what Militant are up to, Kinnock has ‘suspended’ a number of local Labour Party branches, while investigations are carried out into Militant’s activities. Despite Militant’s claims that they oppose these ‘witchhunts’ against them – they are, in fact, delighted when their members are expelled from the Party. That’s because it offers them the chance to draw anger and energy away from the poll tax fight, and re-direct it into defending their supporters from attack. Their ‘disbelief’ and ‘outrage’ at their members being booted out is always well rehearsed. In fact, the expulsions are part and parcel of Militant’s battle—plan – and are the beginning of what, for them, is the real fight. Militant frequently claim to be ‘leading the fight against the poll tax’ – and they’ve launched a national Front-organisation (The All British Anti-Poll Tax Federation) in a bid to stamp their leadership on the movement. Militant seek to run the campaign by freezing-out or crushing independent groups that oppose their manipulation. The set of ‘committees’ full of their own supporters, try to, seize key posts in local poll tax ‘unions’, pack meetings with ‘delegates’ from bogus-community groups and worse. Right from the start of the poll tax struggle, people have mobilised to oppose Militant. Their hopes to establish a stranglehold on the campaign have been dashed – and increasing numbers of people are coming to realise what Militant’s ‘hidden agenda’ is really all about. Of course, Militant and the SWP are only two symptoms of a more widespread disease. Their are dozens of similar ‘Left-wing’ parties sharing identical assumptions – forever lecturing working class people resisting the poll tax that without the support of Kinnock and the TUC, their struggle is doomed to defeat. Their only concern is in bolstering their own Party empires on the backs of the working class. The poll tax – or ‘community charge’ – is a flat-rate tax levied on people, (not on property, as the old rates system was). Everyone over 18 will have to pay (with very few exceptions). 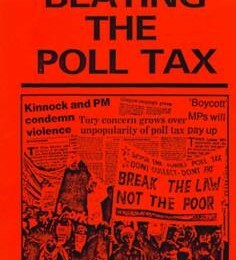 Poll tax was introduced in Scotland in April 1989, and comes into effect in England and Wales in April 1990. Everyone living in the same council area will pay exactly the same poll tax regardless of their income: A factory boss will pay the same poll tax as the people who work on his production lines. Unemployed people will have to find 20% of their poll tax bill out of their giros. They may get a partial rebate of that 20% – but that’ll be based on the government’s fictional ‘national average’ poll tax rate. Working class women are set to lose out badly. Women workers make up a large percentage of the low-paid, and, of course, many women do unpaid work (caring for children or relatives in the home). In either case they’re still expected to pay up in full. Black and Asian families will also be hard hit. As well as being amongst the lowest paid group of workers, poll tax rates in inner-city areas where many Black and Asian families live, are certain to be amongst the highest. Traditional Asian extended families living under the same roof face huge bills.